Sole survivor – Vickers Type 953C Merchantman | Shortfinals - aviation and more! Any country with as rich an aviation heritage as Great Britain is bound to have some significant airframes in preservation. My recent trip focussed on seeking out the rare, the unusual, the unique. Brooklands is a wonderful museum to the south and west of London, in Weybridge, Surrey. It is based on a former Vickers-Armstrongs Ltd facility (later, part of British Aircraft Corporation), which happens to be located alongside one of the most famous pre-WW2 motor-racing tracks, a banked circuit part of which is still in existence. Consequently, the museum which has grown up on this site has twin focii, aviation (with the emphasis on Vickers-built aircraft) and motor sport, although a new museum building, featuring a collection of preserved London ‘buses, has recently opened at Brooklands. There was a time in the early 1950s when it seemed that large turbo-prop airliners had a place in the air transport ‘mix’; early turbojets were very ‘thirsty’, and turbo-props seem to offer much better operating economics, with only a small speed penalty. The Lockheed L-188 Electra and Ilyushin Il-18 were U.S and Russian entries in this field, and it seemed logical that Vickers would want to follow-up their very popular Vickers Viscount (444 built) with a larger, 100 + seat successor – enter the Vickers Vanguard. Engine choice was critical, and the design team settled on four of the new Rolls-Royce RB.109 Tyne turbo-prop engines. The performance of the prototype, the Vickers Type 950, G-AOYW, attracted orders from British European Airways (6 x Type 951, plus 14 x Type 953, powered by 4 x 4,985 eshp Tyne Mk. 506) and Trans-Canada Air Lines – eventually, Air Canada – (23 x Type 952, with 4 x 5,545 eshp Tyne Mk. 512). The Vanguard was fast – it cruised at 412mph – so that at sector lengths of 300 miles or less, there was little difference in timings between it and contemporary jetliners. However, it had an amazingly complex set of engine and propellor controls and all the flying controls were manual! As well as that, the noise from the many auxiliary power take-offs and gearboxes, which took power off the big Tyne to run various aircraft systems, was quite something. I remember being on the ramp at East Midlands International Airport (EGNX) where I worked, as a freighter version of the Vanguard – a Merchantman – ran up its engines prior to a night-time departure, and being really glad for my pair of ear defenders. In general, passengers enjoyed flying in the Vanguard (despite the occasional incidence of in-flight sympathetic vibration) but pure jet airliners were taking more and more of the market. There were no other customers, and the production line closed in April, 1964, after 44 aircraft, with the delivery of CF-TKW. By 1969, BEA had converted nine Vanguards as freighters (Type 953C), and called them Merchantmen. Capable of carrying 19 tonnes of freight, they were extremely successful, and some were sold on to other airlines. Air Bridge Carriers (out of East Midlands International) operated them under contract to various airlines (DHL, Elan, etc), and other freight operators included Air Trader, Europe Aero Services, Silver City Airways and Inter Cargo Services. 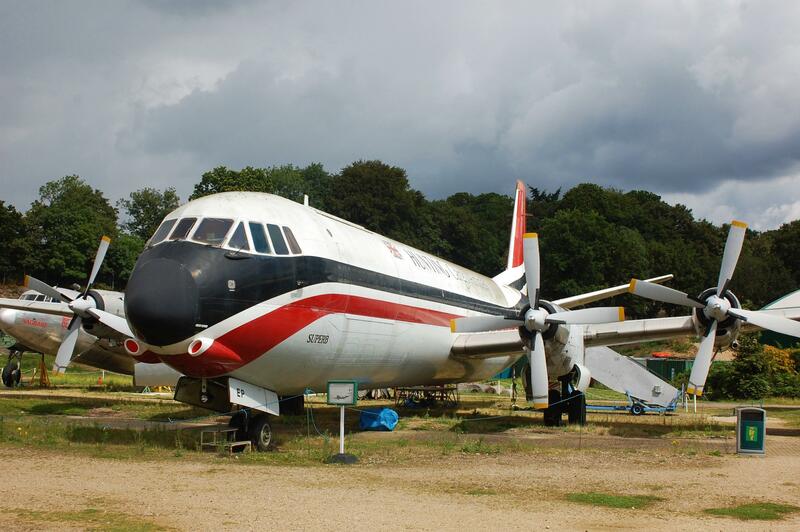 The very last active Merchantman was G-APEP, ‘Superb’ of Hunting Cargo Airlines (as Air Bridge Carriers had become), and this was flown onto the (then) former Vickers works runway at Brooklands on 17th October, 1996. For several years, the aircraft was kept serviceable – despite a lack of spares – and it used to be taxied along the runway from time to time. It was finally taken into the Aircraft Park at Brooklands, and into retirement, on 5th June, 2004. Sadly, there will be no more aircraft flown into Brooklands, as the site of the former runway is now ‘Mercedes World’. There are other Vanguard/Merchantman nose sections in existence, including G-APES, ‘Swiftsure’, at East Midlands International Airport ‘Aeropark’, but G-APEP is the sole, complete, survivor. I am extremely glad that I had the chance to see this important piece of airliner/freighter history! although officially a Merchantman, I always called the freight versions -the Guards Van – seemed appropriate somehow. I think that you have it right, David. I know that it was like being overtaken by an early ‘Deltic’ diesel locomotive, whenever one of them slowly taxyied past me on the tarmac at East Midlands Airport!